Breakfast Cookies For Eating ALL Day Long! These cookies come from my friend Sarah of Southwestern Quinoa fame. She was telling me about these cookies and about how they are healthy enough to eat for breakfast. I know that I’m always saying that pies and cobblers can be eaten for breakfast but these Banana Oat Breakfast Cookies are the real deal. Say goodbye to those store bought granola protein energy fruit bar things. If you are Gluten Free and/or Vegan, don’t faint, but these cookies are for YOU! They’re also for the rest of us because these are SERIOUSLY GOOD! And if there was not enough to exclaim over, these are ridiculously easy to make. 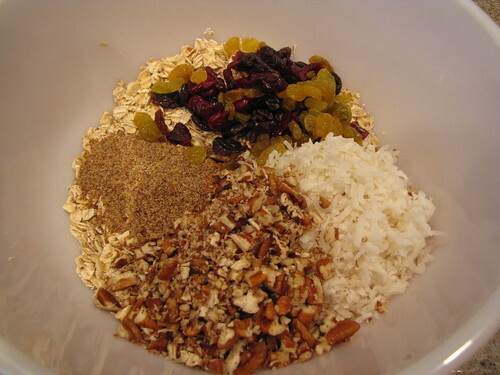 Ripe Bananas, Rolled Oats, Coconut Flakes, Flaxseed Meal, Salt, Pecans, Coconut Oil, Agave Nectar, Dried Fruit (Raisins, Craisins, Cherries shown here), and Vanilla. Chocolate Chips optional. 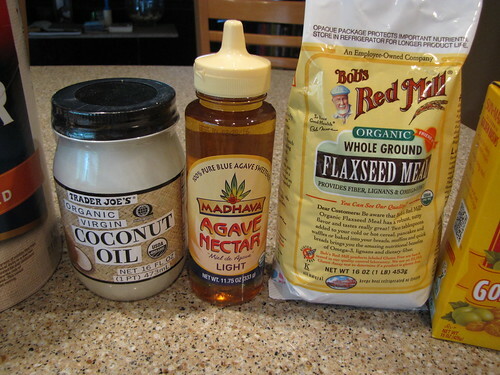 In place of the usual butter, flour, and egg are some fun, healthy substitutions like Coconut Oil, Agave Nectar, and Flaxseed Meal. I was able to find all of these at my local store even though the coconut oil pictured happened to come from Trader Joe’s (which rudely has not moved to my neighborhood yet). 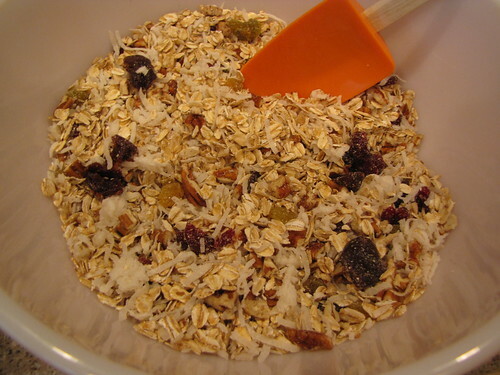 In a large mixing bowl, combine 1½ cups rolled oats (regular old fashioned oats for oatmeal, not instant or quick), 1 cup coconut, ¾ cup chopped pecans, and ½ teaspoon salt. Sarah’s original recipe calls for unsweetened coconut but I couldn’t find any so I used sweetened and used less Agave Nectar. Add 1 heaping Tablespoon of flaxseed meal. I actually had this in my cabinet fully intending to add it to my morning oatmeal. Flaxseed meal is HIGH fiber, high in those good Omega-3 fatty acids we’re all supposed to be eating, and good for reducing cholesterol. 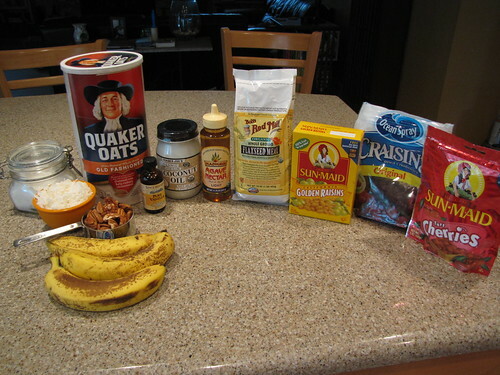 You can sneak it into all sorts of things like baked goods, oatmeal, smoothies, cookies, pancakes, etc. for some extra health benefits. 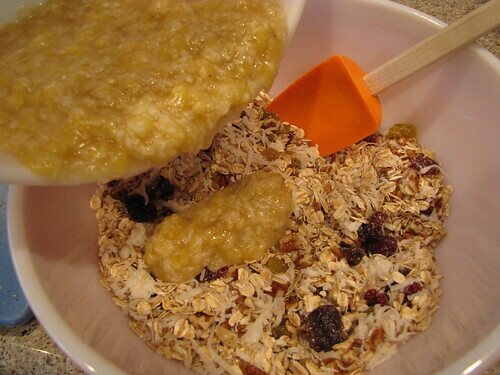 Add 1/2 cup of dried fruit. 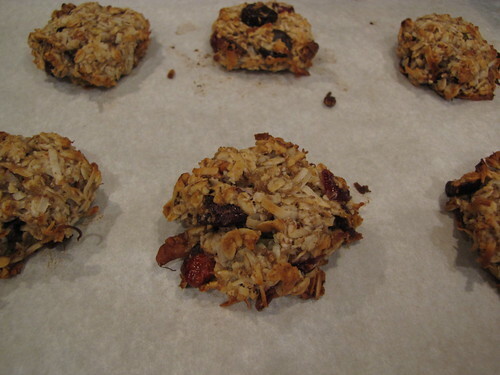 I used a combo of golden raisins, Craisins/dried cranberries, and dried cherries. You could also toss in a few chocolate chips if you have them. I’m sure I don’t need to review the health benefits of dark chocolate for you. This is a new great use for those bananas that are starting to look a little past their prime. In a separate bowl, smash 3 very ripe bananas with a potato masher or fork. 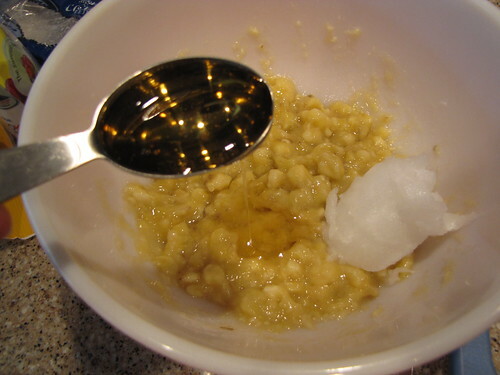 Add ¼ cup coconut oil and 1-2 Tablespoons of Agave Nectar. I hadn’t cooked with either coconut oil or agave nectar before but they have become more popular and easier to find in stores. 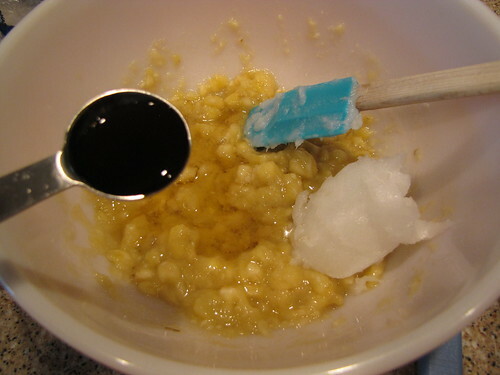 Add 1 teaspoon vanilla and stir to combine the wet ingredients. 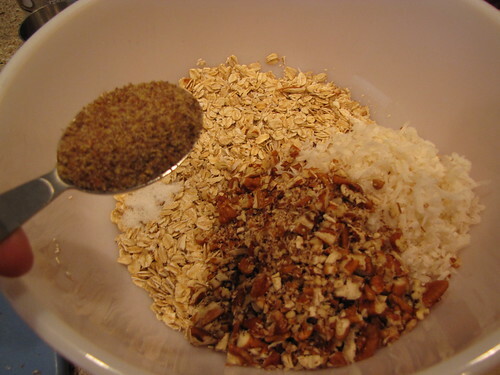 Add the wet ingredients to the dry and stir to thoroughly combine. Scoop out 2 Tablespoons of dough and form it into a ball. 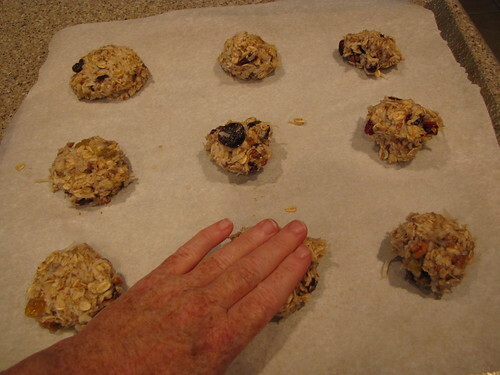 Place the balls on a parchment lined baking sheet and use your fingers to slightly flatten each one into a thick disc. This dough is a little wetter than standard cookie dough so don’t be alarmed if the balls are somewhat sticky. 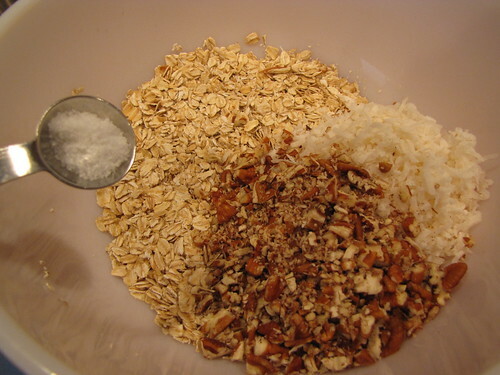 If you feel your dough is too wet, add a few more oats until you have a better consistency. Cool on the tray for 5 minutes so that the cookies hold their shape then move them to a wire rack to cool. This recipe makes 16 soft, moist cookies. Store them in an airtight container to retain their freshness. I made these last week and took them home to my family where they were a big hit. I then proceeded to prove that you can indeed eat them ALL DAY LONG! 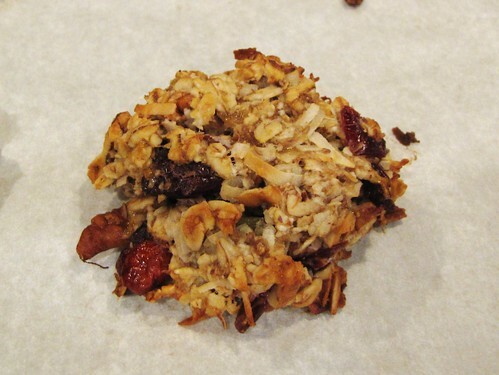 Healthy, delicious cookies that you can feel good about making, eating, and sharing! PS. Hey Gluten Free Folks, there is now a Gluten Free tab down on the right side of the page just for you! Gary, my friend Julie makes a simple version of these (minus chocolate, plus peanut butter) for her dogs! Maybe that could be the next addition to your amazing dog walking business. 🙂 Cookies for dogs and people! I’m going to send the link for this to my friend who is on a gluten-free (and more) dietary plan. I hope she can use it! These lok amazing! AND, in some sort of weird alignment of the stars, I have all of the ingredients on-hand. (Well, except for pecans. Because I don’t like pecans. Because I accidentally ate an EARWIG when I was shelling some pecans once as a child, and it tainted the nut for me forever.) But I have almonds! Off to mix up a batch… THANK YOU from the bottom of my vegan heart! Eeeeewwww! You are forgiven for skipping the pecans. An earwig??? We have those in Florida and I think that would put me off food forever.